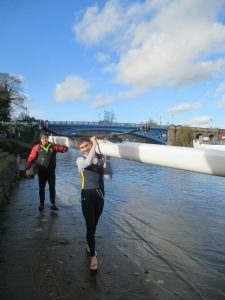 Both divisions at Stourport Small Boats Head saw wooden objects swept down the river by recent rain and a fast stream, and first division racing was delayed whilst a tree trunk was removed. However, the offending item in the second division had been deliberately launched by members of LBC, as ‘Woody’ made its return to racing following a full refit at Brown’s Boatyard, Durham. 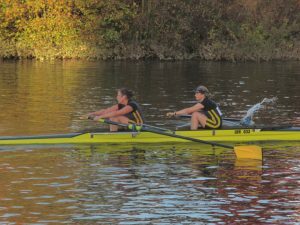 With the new varnish job gleaming in the Autumn sunshine and providing a silky smooth ride, Captain Keith stroked Charlie, Walrus and Jerry to a blistering 36spm finish, as they narrowly held off their younger Worcester competition over 3,700metres. 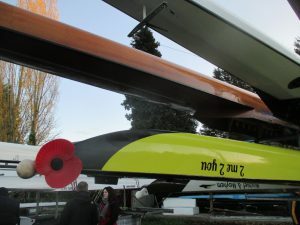 Woody’s finish time of 13 minutes 13 seconds won the Masters Coxless Four category and ranked a very creditable tenth out of a total of 122 boats entered. What more could Walrus want for his 50th Birthday present – he was even given some (free) cake at the end of the day! Meanwhile, further progress was made by the hardened but still relatively novice deckhands racing as Open Senior Low CRI (which apparently stands for ‘Competence, Respectability and Integrity’) although Adam, Jonathan, and Lawrence’s classification under those terms was seriously watered down by the dubious decision to drop Scotty and replace him with the notably virtuous Tim. 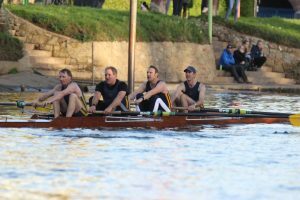 However, they still managed to sustain a tirade of fruity language the whole length of the course (having employed a certain veterinary cox specifically for that purpose) and to their credit finished just 5 seconds behind their opposition from Bewdley, and only 40 seconds behind winning crew Stourport – showing they are in touching distance of the leaders. 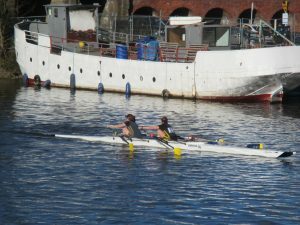 Matannah performed best from the Club’s smaller boats, finishing in 14.24 midway between their competitors, with Thomara just 33 seconds behind, and the Womens Masters D Quad only slightly later. However, in a ‘Derby’ match against Derwent, Vicky and Emily struggled to overcome the huge wind resistance created by the very largest of poppies that appropriately adorned ‘2 Me 2 You’, in recognition of Remembrance Sunday and 100 years since the end of the Great War.